After spending many years in a foreign country, Lucy returns to her family’s rambling lakeside house. There she finds herself haunted by the curious circumstances of her father’s death 10 years ago. Sleepless one night, and pacing the moonlit hallways of the house, she makes a momentous discovery – locked in a window seat, she finds a collection of what at first appear to be idle curiosities. But each of these objects holds a secret. As Lucy begins to piece together her family’s true history – from an heirloom tapestry and old political tracts, to a web of allusions depicted in a stained glass – she realises that the story she has always believed were a fiction. And then, adding to her confusion, there is Keegan Fall, a local glass artist who was once her passionate first love, who stirs up old longings and who will lead Lucy to unexpected places. On the cover, it was stated that in year 2007, The Memory Keeper’s Daughter captivated over 6 million readers worldwide. Unfortunately, I am not among the 6 million readers so I approached The Lake of Dreams with some apprehension but determination and faith. I am duly rewarded as the book managed to captivate my curiosity and attention and I came away enjoying it. Lucy Jarrette is the main character and the one pushing for the truth to be revealed based on the discovery she made in the family home one day. Not everyone welcomes her investigation as they felt that it was of no relevance but for some reason, Lucy was consumed by it and slowly, the truth about the family history is revealed and its impact on the family was felt by all – her mother – Ann, her brother – Blake, her uncle, cousins, etc but most of all herself. I love the way the author builds up the tension of the story and I especially loved reading the letters that Lucy found. I can see that Lucy identifies herself with the author of the letters who is one of her ancestors especially the restlessness that they both felt in their individual life. The Lake of Dreams is published by Penguin. I should think they have a bestsellers in The Lake of Dreams which can be made into a wonderful movie and I would love to see the small town especially the chapel with the stain glass coming alive on screen. 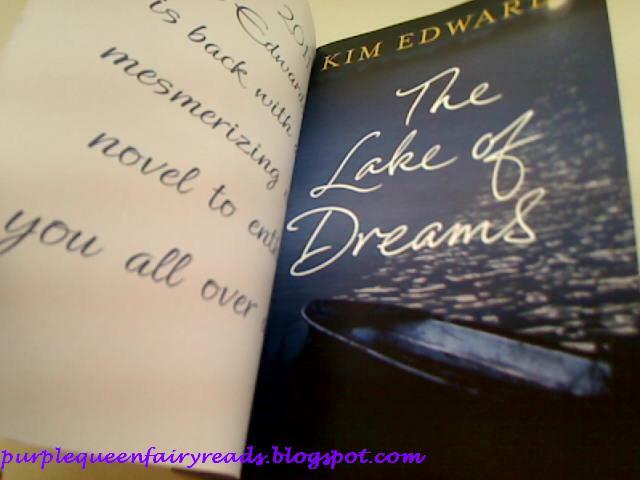 The copy of The Lake of Dreams that I have is an uncorrected proof copy. Thank you Pearson Malaysia (especially CYH) for this copy. I shall now check out The Memory Keepers’ Daughter and be among the 6 million readers.